Retrofitting and revamping access to all buildings in a whole country is a massive task. The Building and Construction Authority has been driving the Singapore government’s efforts in creating a barrier-free country that is accessible to people of all ages and abilities. Since the Code on Barrier-Free Accessibility in Buildings was implemented in 1990, the accessibility of buildings in Singapore has improved significantly. As the Code was applied only to new building projects, the Building Construction Authority had to come up with various ways to upgrade the existing building stock. This was a enormous task, given the sheer number of properties built before the Code came into effect. Along with Singapore’s rapid urbanization from the 1950s to 1980s, a dense, high-rise built environment was created. As the majority of the population then was young and able, the need to provide barrier-free accessibility was not a critical concern. The focus was on maximizing land resources for the economic and social needs of a growing population. The year 1990 saw a milestone in Singapore’s accessibility efforts. Although the population was still fairly young, the Code on Barrier-Free Accessibility in Buildings was introduced to help improve accessibility standards, especially for wheelchair users. The design and construction requirements set out in the Code were mandatory for all new building projects. The Code benefits anyone with physical limitations, including elderly individuals who are not wheelchair bound. It had been estimated that between 2006 and 2030, the number of senior citizens, many of whom would face deteriorating physical abilities, would increase threefold. Thus, the goal of cultivating an inclusive built environment that supported “ageing-in-place” was conceived, to help individuals adapt to ageing in their homes—surroundings familiar to them. This would also allow families to care for older members more easily. The Building Construction Authority has incorporated the concept of universal design, or “design for all,” into its mission to address the needs of people of all ages and abilities. With this goal, a key challenge was upgrading the large existing stock of buildings built before the 1990 Accessibility Code came into force. There was also a need to go beyond providing barrier-free accessibility within buildings and ensure that the surroundings of buildings are similarly barrier-free. In 2006, the Building Construction Authority started a big push for universal design with the launch of the Accessibility Master Plan. 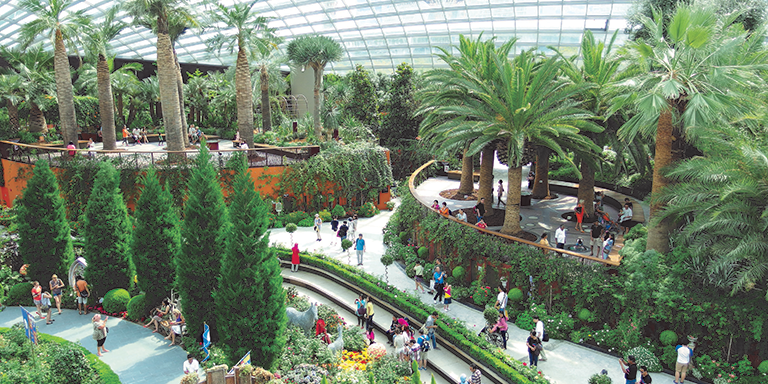 Holistic and collaborative in nature, the plan allows the Building Construction Authority to work with other government agencies to tackle the challenges of creating a user-friendly built environment in Singapore. To address older buildings that were not barrier-free, the Building Construction Authority implemented an accessibility upgrading program from 2006 to 2011, targeting buildings and areas regularly visited by the public. Since 2007, the Building Construction Authority has been advising government agencies on the upgrading of public-sector buildings with a set of basic features for accessibility, which covers the approach to buildings and the first story of the buildings, including a toilet on that level. The Building Construction Authority has also played a role in facilitating and monitoring the upgrading process. To incentivize owners of private-sector buildings to upgrade their premises to be barrier-free, the Building Construction Authority introduced the Accessibility Fund in 2007, which co-pays up to 80% of the total cost of refurbishing buildings to include basic accessibility features. In particular, the Building Construction Authority worked with building owners to improve accessibility along Orchard Road, a popular shopping district where most of the buildings were built before the introduction of mandatory requirements in 1990. The Accessibility Code has undergone several revisions and updates to meet the needs of the time. The last review of the Code was conducted between 2011 and 2013. It was a collaborative effort involving the people, private and public sectors. Numerous public consultations, focus group discussions and user trials with stakeholders were held to ensure that the Code was comprehensive and could benefit more Singaporeans. For example, the 2013 Code review highlighted the need for more facilities that could cater to people with diverse needs. Child-friendly sanitary facilities and family car park lots have thus become required in buildings such as sports complexes and large shopping malls. Other features that have become mandatory include Braille and tactile information for public toilet signs, and hearing enhancement systems in venues such as function rooms and auditoriums. The Code was also refined to include wider corridors to allow easy access for wheelchairs and prams. At the same time, the Building Construction Authority continues to encourage developers, building owners, designers and other industry stakeholders to apply universal design in new developments and those undergoing upgrading. To encourage stakeholders to do more than just comply with the Code, the Building Construction Authority promotes universal design through courses, roving exhibitions and seminars. It also began giving out Universal Design Awards in 2007 to recognize development projects that show extensive efforts in applying universal design concepts with user-friendly features. A “sensory garden” open for public viewing at the Building Construction Authority Academy serves as a model to demonstrate the universal design concept. To widen outreach efforts, the Building Construction Authority has begun to rate the user-friendliness of buildings. This information is available in the Friendly Buildings Portal, where users can check the level of accessibility of a building. A mobile application has also been developed for this purpose. Today, people using wheelchairs and other mobility aids are no longer confined to their homes. They can often be seen moving around neighborhood markets, food centers, shopping malls and activity centers with ease. As of March 2012, close to 100% of public-sector buildings regularly frequented by the public had achieved basic accessibility, while the proportion of buildings along the Orchard Road shopping belt providing basic accessibility had increased significantly to 88%, from 41% in 2006. In 2012, the Universal Design Awards was replaced by the Building Construction Authority Universal Design Mark, a voluntary certification scheme that recognizes building owners for their efforts in incorporating universal design into their developments. As of May 2017, 149 building projects had received the Building Construction Authority Universal Design Mark. As part of their design briefs, many developers now indicate their desire to achieve Platinum rating, the highest standard, for the Building Construction Authority Universal Design Mark. In 2013, the Building Construction Authority Universal Design Mark was recognized as an innovative practice at the international Zero Project Conference at the United Nations Office in Vienna, Austria. John Keung. 2015. No More Barriers: Promoting Universal Design in Singapore. Urban Solutions, Issue 6: Active Mobility. February 2015. The Centre for Liveable Cities, Singapore.